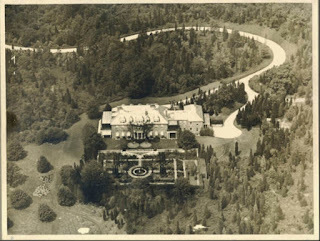 'East Woods', the Henry Rogers Winthrop estate designed by d'Hauteville & Cooper c. 1910 in Woodbury with landscaping by Guy Lowell. Winthrop was a partner in the brokerage firm of Harris, Winthrop & Co. and later Winthrop, Mitchell & Co. and Winthrop, Whitehouse & Co. In 1910 he was elected the first president of the Piping Rock Club, a post which he held for 40 years. He was also a former president of the New York Genealogical and Biographical Society. He retired to Sarasota, Florida in the late 1940s and died at the age of 82 in 1958. 'East Woods' has since been demolished. Click HERE to see his Manhattan residence at 120 East 78th Street which he sold in 1947. Photo from the Ryerson & Burnham Archives at the Art Institute of Chicago. I do love that winding approach drive. Today's wealthy seemingly put little to no stock into the delights of having a long, meandering private lane past specimen trees with glimpses of their home through the occasional break in the trees. 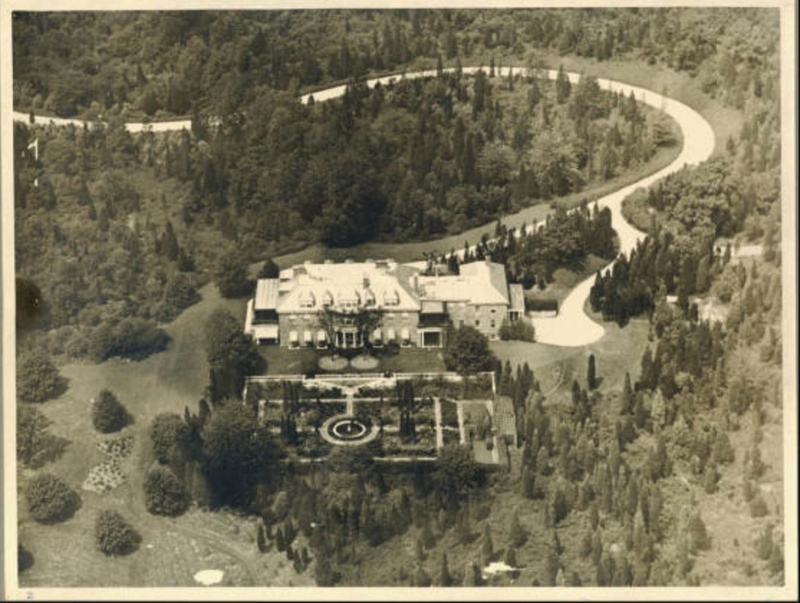 Off topic but relating to another home owner featured before - V. Everett Macy - is his Delano & Aldrich (c. 1907) estate in the Catkills still being sold by the Hunter Foundation? "Hathaway" in Tannersville (NY) in an arts & crafts style was being offered (without a price) on 200 acres as recently as October. His LI estate was by Albro & Lindeberg and located in Hewlett. That was razed after his relatively early death. Woodbury is pretty hilly..I would love to know where this one sat...and in 1910 terms,(and with today's car clogged LI roads) pretty far away from PRC. Curious. Completely unrelated...but I walked past Daniel Day Lewis on the street in Greenwich Village this morning...he was just taking a walk with no jacket like he's no big deal (no hat, no sunglasses). And there went Abe Lincoln crossing Sixth Avenue...which completely blew my mind. Don't forget Bill the Butcher. I really wanted to say something about There Will Be Blood...one of my favorites. Apparently the tennis house survived and is part of a sale.